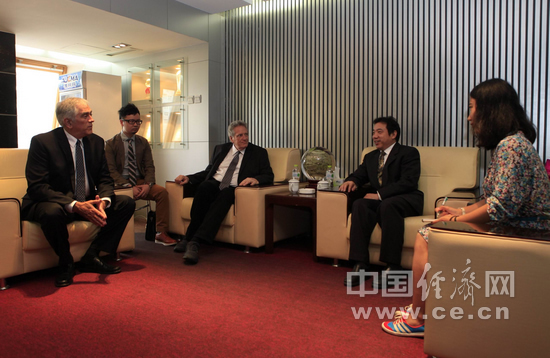 CEN President Mr. Wang Xudong(second from right) met with President & CEO of China West International (CWI),Mr. David Abbott(first from left), and CWI Media Executive, Mr. Charlie Weber (third from left) and his party on July, 9th 2014. CEN President met today with the visiting guests from Canada, Mr. David J. Abbott, CEO of China West International Inc.(CWI). Mr. Abbott and his party have had very productive exchanges with CEN Executives on the development of their joint “Investing in North America” Channel, through their official Corporate Partnership with CEN. Mr. Wang Xudong expressed that CEN has great International credibility as the largest and most comprehensive internet website focusing on the Chinese economy, with a substantial world-wide following, especially from the USA. To increase their global reach, CEN Korean language channel will be added soon, making nine (9) language editions in total. For better service to entrepreneurs, both from China and abroad, CEN provides a key platform for the promotion of co-operation between Sino-Foreign enterprises, around the world. This effort is one of the core missions of CEN. Mr. Abbott’s visit and work on the “Investing in North America” Channel, will surely facilitate a deeper understanding of the opportunities and benefit from cooperation from both sides. Mr. Abbott said to the CEO of CEN, “It was a tremendous experience to work with the CEN staff on the preparation work of Investing in North America” and to establish such a solid foundation for bridging Chinese enterprises “going abroad” to the North American continent”. As planned the Channel will provide comprehensive information on North American economic development, as well as civil living and cultural life. Not long ago CEN and Canada Deluxe Technology and Trading Co., Ltd. had reached an agreement and China West International is the fully authorized and exclusive agency to run “Investing in North America” Channel sourcing Canada / USA projects in need of foreign investment by Chinese businesses and investors. According to the agreement, “Investing in North America” Channel will supply not only detailed project information and a complete selection of Sector Funds, but also will work with all National, State and Provincial governments, to provide useful information of regarding local law, securities regulations and investment environment updates. With Mr. Charlie Weber in the union, “Investing in North America” Channel has a bright future. It is understood, the former President & CEO of Lucasfilm produced some of the most memorable films of our time, including the time honored USA classic science fiction film series "Star Wars", Raiders of the Lost Ark and Blade Runner. Charlie Weber has joined the China West International Executive Team as the CWI Media Executive Director.